Who buys the majority of Chromebooks? Suckers in America (since US accounts for 84% of Chromebook sales)! Yes, suckers in the US (mostly schools and consumers) fall prey to media drivel by third rate hacks about the miraculous capabilities of Chromebooks and buy these devices. American businesses are smart and have long realized that Chromebooks are junk with little value. So they have shunned Chromebooks. According to a recent report from market researcher Gartner, businesses account for a piffling 1.1% of Chromebook sales in the US. Acer was the top Chromebook vendor worldwide in 2014 (2 million units) followed by Samsung (1.7 million units) and HP (1 million units). Now I have thought long and hard about Chromebooks and still can’t figure why people would want to squander money on this junk. Running on Google’s Chrome OS, the Linux kernel based Chromebook’s distinguishing traits are anemic memory, pitiful amount of storage, effete processors, a reliance on an unreliable and insecure ‘cloud’ to perform a lot of tasks and a sealed box (occasionally) that prevents users from upgrading the weak components. A gaggle of vendors including Acer, Asus, Samsung, HiSense and HP make Chromebooks that are sold in retail stores like Best Buy or online at Amazon or NewEgg. Chromebooks are really not that cheap although media reports frequently mention their so called low price as a plus point. If Chromebooks were really cheap and offered good value for money, first time computer buyers in Asia-Pacific would be buying them in the tens of millions. But computer buyers in the Asia-Pacific have largely shown their collective middle finger at Chromebooks. They too have realized these devices are worth zilch. 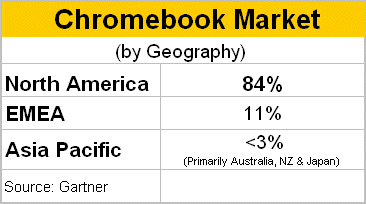 Chromebook sales in Asia-Pacific are pitiful and account for less than 3% of total Chromebook sales (and much of the little sales in Asia-Pacific come from developed/richer nations like Australia, New Zealand and Japan). The cheapest Chromebook with 32GB of storage costs $279 at US retailer Best Buy. For an extra $25, I can get a Dell Inspiron 15.6-inch Laptop (AMD A6-Series) with 4GB Memory and 500GB Hard Drive. The Dell laptop is a far superior alternative to a Chromebook. Now why would anyone with an iota of sense anywhere buy a Chromebook given its pitiful specs and capabilities? Global sales of 5.73 million Chromebooks in 2014 accounted for less than 2% of PC sales (Source: Gartner Research, May 21, 2015 and Gartner Research, January 12, 2015). Gartner predicts Chromebook sales in 2015 will be 7.2 million units. Only shows that there are still millions of clueless dolts in North America and Europe.